A host of aspiring and proven hurdling stars are among the entries revealed for The Festival’s four Grade One novice events. As ever, The Festival - starting this year on Tuesday, March 16 - kicks off with the SPINAL RESEARCH SUPREME NOVICES’ HURDLE. There are 104 entries in this year’s renewal of the two-mile contest with last year’s runaway Weatherbys Champion Bumper hero Dunguib currently a red-hot antepost favourite. Philip Fenton’s stable star, who is set to run at Leopardstown on Sunday, is one of 36 entries trained in Ireland with the Dermot Weld-trained Rite Of Passage, last year’s Weatherbys Champion Bumper third, another engaged. The Philip Hobbs-trained Menorah, who beat Bellvano by 12 lengths in a Kempton novices’ hurdle on Boxing Day, and the Nicky Henderson-trained Oscar Whisky, a dual bumper winner who made a sparkling start to his hurdling career at Newbury in December, are among the domestic entries. The NEPTUNE INVESTMENT MANAGEMENT NOVICES’ HURDLE on Wednesday, March 17, is another race with a new sponsor this year and has attracted 112 entries of which 37 are trained in Ireland. Rite Of Passage has the option of this two mile and five furlong contest in which the Donald McCain-trained Peddlers Cross, another Spinal Research Supreme Novices’ Hurdle entry, is also prominent in the antepost betting. The unbeaten Quantitativeasing, trained by Nicky Henderson for J P McManus, looks set to be another leading fancy alongside the likes of Reve De Sivola, winner of the Grade One Challow Novices’ Hurdle at Newbury on December 29, and Quel Esprit, one of 13 entries for trainer Willie Mullins. Najaf, a Grade One winner in France, is an intriguing entry. He has yet to run in Britain but joined Paul Nicholls after being bought in November for 250,000 euros by the families of leading owners Andy Stewart and David Johnson. Further international spice is added by the classy Australian-trained hurdler Onajet, trained by Anthony Cosgriff. The JCB TRIUMPH HURDLE on Friday, March 19, is shaping into an ultra-competitive renewal. Betting is headed by the Alan King-trained Mille Chief, a 14-length winner at Huntingdon on January 27, although a gamble in recent days has seen the Nicky Henderson-trained According head to the front of the market. A three-time Flat winner for Freddie Head in France, the Dalakhani gelding has yet to run in Britain but has several entries in the coming days. He is in the same ownership as Zaynar, the winner of this race 12 months ago. A 21-strong entry from Ireland includes the Gordon Elliott-trained Carlito Brigante and Alaivan, who filled the first two places in a Grade Two hurdle at Leopardstown on Boxing Day. Pittoni, who has won both his starts for Charles Byrnes, is another member of a powerful Irish team. There are 91 engaged in the ALBERT BARTLETT NOVICES’ HURDLE on Friday, March 19 and a potential Irish challenge of 30 is headed by the Paul Nolan-trained Shinrock Paddy, who won a Listed bumper at Cheltenham in November, 2008, and recorded an impressive 15-length victory on his latest start in the Grade One Barry & Sandra Kelly Memorial Novice Hurdle at Navan on December 13. Nolan reported: “Shinrock Paddy holds an entry in both the Neptune Investment Novices’ Hurdle and the Albert Bartlett Novices’ Hurdle but he is more than likely to go for the three-mile option. He just got a bit of infection in one of his heels last month but he is 100 per cent now and we will head straight to The Festival with him. I don’t want to rush him into running and he will have a gallop on the grass before heading to Cheltenham. “He won a Grade One very easily and, while the runner-up has disappointed since, The Hurl (third) won well on his latest start. 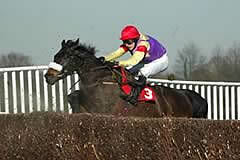 If our horse can reproduce that kind of form at Cheltenham, then he should have a nice chance. Australian trainer Anthony Cosgriff plans to be represented by the eight-year-old Gorge, who finished fourth in the Grand National Hurdle at Sandown, Australia, in August. A notable chaser with an entry is the David Pipe-trained Madison Du Berlais, runner-up to Kauto Star in this season’s Grade One King George VI Chase, while Evan Williams has entered Cappa Bleu, victorious in the 2009 Christie’s Foxhunter Chase at The Festival. Henry Daly has entered the John Smith’s Grand National hope Possol. Other interesting contenders include Tell Massini, trained locally by Tom George and the winner of Grade Two novices’ hurdles at Cheltenham in both November and December. Restless Harry also has winning form at Prestbury Park having impressed on Saturday when landing the Grade Two Neptune Investment Management Novices’ Hurdle.